One of the best parts of boating is the ability to watch wildlife that you would not otherwise see. Seabirds are a great example of this, and watching them can be a rewarding pastime. 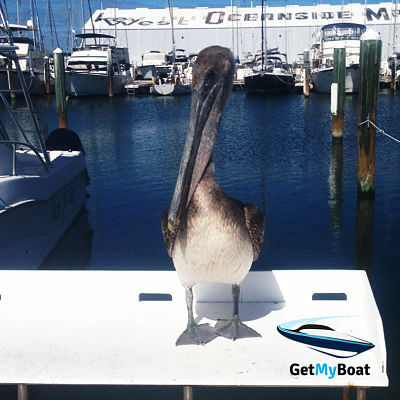 You need very little to watch birds from your boat, besides a keen pair of eyes and an active curiosity. However, there are a few things that can make the experience even better, and possibly spark an addiction that many before you have shared. Watching birds from boats is often easier than finding them on land. Because water birds are, in general, larger than other kinds of birds, they are easier to spot. Most adult seabirds have some form of black, white, or a combination of the two. It is also much easier to find birds sitting on the water, out in the open, than it is when they are hiding in trees. Even with all this, a good pair of binoculars is always a good idea to get a closer look for species ID or watching certain behaviors. Find a set of binoculars that are water-tight. Even if you do not knock them overboard (a good float attached to the neck strap can help you keep from losing them), some binoculars will end up with lenses that are fogged from the inside, which is nearly impossible to fix. Another thing to consider is the swell on the boat: it is not easy to keep traditional binoculars fixed on a small object when you are bobbing up and down. There are certain brands that will make them motion-compensated, which means that they will stay steadier while you wiggle, without losing your target. They cost a little more, but if you are a serious birder, you will definitely appreciate the difference. A smaller boat is a great piece of equipment if you plan on spending a day on a lake or in a fjord or mangrove. Canoes, kayaks, rowboats, and skiffs will allow you to be low enough to the water to make an ID, and to navigate the shallow, vegetated waterways where birds seek cover. Another good thing to have when you are birding is some kind of ID guide. Many different kinds are made, but there are certain things to consider when choosing a good one. Pictures versus Illustrations: Whether you prefer a drawing or a photo is often a judgment call. The important thing to consider with either kind of image is that all of the different seasonal plumages for winter and summer birds, and different geographical plumages of the bird are shown. In addition, the book should make special note of the physical differences between male versus female, and adult versus juvenile. In cases where there are a lot of species that look very similar, like gulls, you want a guide that calls attention to certain portions of the animal that are used as a species ID — the color of feet, the tail shape, etc. This can help you from staring blankly at six pages of gray and white gulls with no clue where to begin. Range Description: This is a map and description of where a bird is likely to be found. Pay attention to both location and description of location type, as a bird in the book may be found in the general area, but not in the kind of habitat where you see your mystery bird. The range section also comes with the months of the year where they can be found in a certain area. This is also an important part of making a proper ID. Behavior and Habitat: The better description of what a bird does, sounds like, etc., the more confident you can be that you have found the right bird. Birds like cormorants, for example, do not have waterproof wings, but spend time on rocks and buoys drying themselves with wings outstretched. Specific information like this can let you take a bird that might look like a black duck to a novice and make it quickly clear which unique species or family of bird you are looking at. Similar Species: A good guidebook will take the species of birds that are most commonly mistaken for the bird on the page, and go into a description of the specific things to look for that make them different. This gives you a much clearer idea of whether you have found the bird you are looking for, or a good idea of where to keep looking when you realize you are wrong. Common versus Comprehensive: ID guides come in one of two forms. Some will work with every species that has ever been seen in a region, even just once in a while. The other will only show birds that are commonly found in an area, but often provide a much deeper and more descriptive level of information about the life history and behavior of the species that they cover. Look for a book that has a level of information that you are comfortable with, but beware that it may miss certain species. There are some who will have both kinds of books on hand, and begin with the more in-depth book featuring common birds, and move to the more comprehensive tome when the species that they are looking for evades them. If you are birding at sea, be certain that the book you are using has a strong seabirds section. Since terrestrial birds are the focus of many of these books, more generic guides often will just gloss over the topic of seabirds and you will end up with a lot of unknowns. Apps: While books were once the only option, there are some great birding apps that provide not only pictures but song clips as well. Some of the highest reviewed paid apps include Audobon and iBird, and the Cornell Lab of Ornithology has recently created a free birding app called Merlin that is available as well. Not sure which you want? Look for free trials to see which ones are easiest for you to use. Remember that these apps often require a strong signal connection, so they do not work well when you are out at sea, though on a lake with good cell reception, they can be quite handy. Find the Food: Whether your bird is a seaweed-eating vegetarian that likes lakes or a deep-diving fisherman, going where the food should be is a great way to catch a glimpse at many bird species. Freshwater vegetarians can often be found around edges of lakes, where the seaweed is thick and the cattails or edge vegetation can hide them from potential predators. Wading birds like storks and herons can be found in shallow water edges, both open and wooded, as they wait patiently for prey to swim by. Seabirds that are fishermen will be found in the highest concentration areas of fish — these large schools, when they hit near the surface, are called bait balls, and often have a large number and variety of birds that take advantage of the fishy buffet. Consider Habitat Needs: If you are not finding the birds that you want in their usual dining grounds, consider habitat needs, particularly during nesting season. Some birds will hide their nests in shoreline bushes or reeds, and are not easy to discover. Other species, like gulls and other seabirds, like finding treeless, remote islands where they can nest en masse on the bare rocks. Wading birds like to nest on high treetops in wetlands near large water bodies. Shore birds like sandpipers often spend their time on beaches, and nest in the tall grasses or rocky areas around them. Many new birders are tempted when they find a close match to a bird they have never seen before to assume that it is something exotic. This is especially the case when they find something in their book that looks similar, but not exactly, like what they found. However, follow the old adage, and if you hear hoof beats, look first for a horse, and not for a zebra. If your book brings you to something exotic, look for similar species first. Consider that the bird may be in the middle of a shift between summer and winter plumage, and will not look like the pictures. Look to see if a similar species is known to crossbreed and make a hybrid. If you are still coming up zebras, make note of what characteristics you are using to make your ID. Take pictures if you can, and consult an expert. Gulls: Mostly white with gray or black markings, rounded tail and wings. Terns: Mostly white with gray or black markings, V-shaped tail, pointed wings. Alcids: Black and white like a penguin, live in the Northern Hemisphere. Penguins: Live in the Southern Hemisphere, black and white, flightless. Pelicans: Large beak with a “pouch” for holding fish. Albatross/tubenoses: Looks like a large gull but with little barrel-shaped tubes to help expel salt from the body. Sandpipers: Small, long-legged, brown. Live on the beach with narrow, thin bills and feet that are not webbed. Herons: Long legs and long necks that are curved and retracted when in flight. Narrow bills. Storks: Thicker bills than a heron or stork, often taller as well. Cranes: Long-legged wading birds that look much like herons, but fly with outstretched necks. Ducks and Geese: These common water birds (short-necked for ducks, long-necked for geese) are known for webbed feet, and wide, spoon-like bills. 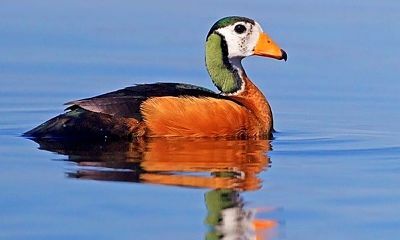 They have a wide variety of plumage, and ducks can be further identified by whether they are dabblers (they stay afloat with bottoms in the air while they eat) or divers. The world of birding is a fascinating place, and water birds are an easy and rewarding way to experience this. Seabirds are rarely scared of boats, and you are often able to approach rather closely on your boat, and have a long look at a flock when birding by boat. Taking up this hobby is a great way to become more aware of your surroundings, and to help you and your passengers develop an even greater respect and knowledge of your marine environment.